My trip to Tierra Patagonia didn’t start out the best way. It was unfortunate that I was on the last flight from Santiago to the far southern Chilean city of Punta Arenas. With a stop en route, the flight was over five hours long in total, which meant arriving into Punta Arenas relatively late at 7pm. 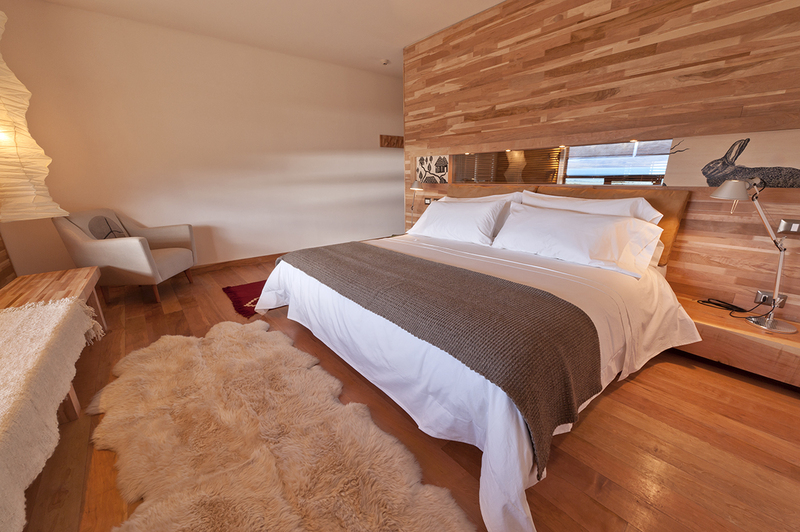 And although 7pm is still are relatively civilized time, the main problem was that it was over five hours drive from Punta Arenas to my hotel in Torres del Paine National Park (Tierra Patagonia). So I wasn’t going to get to bed until well after midnight. Fortunately once I arrived Punta Arenas my driver already had a packed dinner ready for me. We set off immediately, driving along in almost complete darkness, with the exception of the odd road sign, which would light up like a beacon among the surrounding nothingness. The driver was very friendly and I tortured the poor man by practicing my basic Spanish on him. 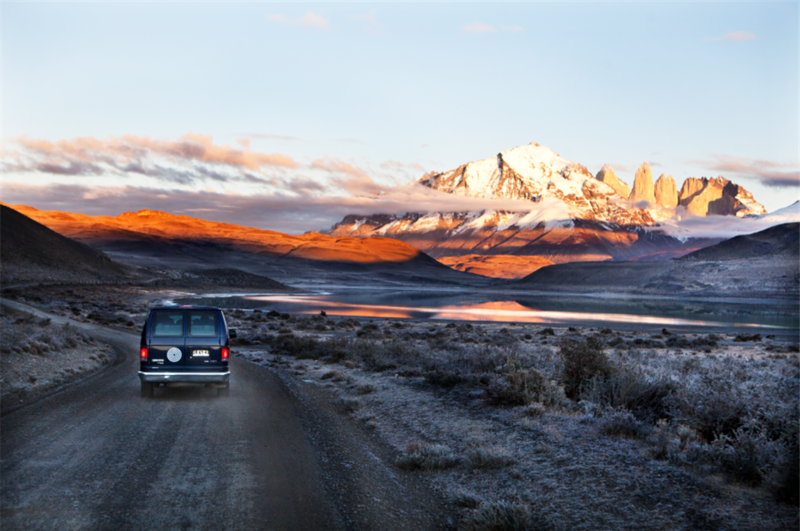 After a long drive we finally reached our hotel in the middle of the Patagonian wilderness, or at least I was told we had – from the back the hotel is almost buried underground, meaning that as you approach it you only see a small hill, with an entrance corridor leading inside it. Making my way inside I checked in and was then met but the hotel’s chef, who had kindly stayed up to offer me a late, second dinner. I politely declined as I was only interested in finding my bed and collapsing on it at that point. I was struck by this offer of chef cooked meal at such a late hour – I had a feeling the hotel wasn’t going to disappoint. In the morning we were presented with a number of activity options for the day. 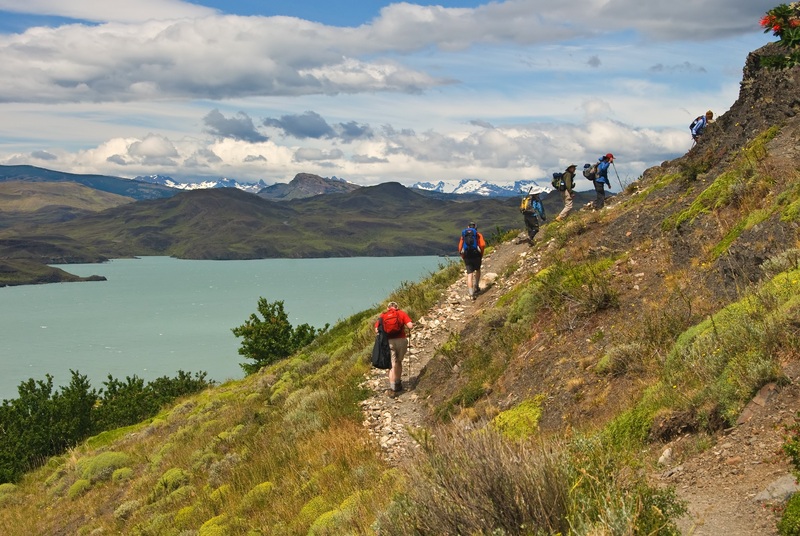 They ranged from a hard trek to the base of the Torres del Paine towers through to easier flora walks. The easier walks were encouraged for people on their first day, or those who had arrived late. Given that both applied to me, I naturally chose to the base of the towers walk. So, off we set. It was about another hour’s drive from the hotel to the trek starting point. The trek is actually part of the famous “W” trek – which takes around five days to complete and is so named because the walk takes in three valleys, hence making a W shape. The trek to the tours was basically the last upward stroke on the W and possibly it’s most impressive part. The trek was around 20 km in total – 10 km there and 10 km back. When we arrived my motivation levels weren’t super high. I hadn’t slept particularly well and now we were (apparently) standing at the base of some large mountains, surrounded by fog. Nether the less, we set off up the hill, slowly making our way through muddy fields and space vegetation. I was hoping that it would get better than this! After almost an hour of walking we reached the “corner of the winds”. It was given this name because it’s apparently normally the widest part of the whole part. I thought that this trek isn’t seeming to get any more attractive for me at this point – although mercifully there isn’t that much wind that day. But despite my concerns, from there the trek got a lot more interesting. As we rose in altitude the Linga trees that started to not only become more prevalent, but they also were changing colour – spectacularly. At the beginning of the walk there were the odd green Linga tree scattered here and there. Now the trees alternated between green, yellow and orange – some of them even a fire red. And the trees were no longer spare – we were in a forest! The thickening of the forested seemed to coincide with one of the old refuges, back from the original climbers in the park. The first people to attempt climbing the surrounding peaks organised themselves in these small huts which were scattered throughout the “W”. This hut was the Chileno hut, or Chilean – the local’s hut. There were a couple of small, rudimentary wooden walking bridges in the vicinity and looking at them sitting in the surrounding forest was like looking at a completed jigsaw puzzle. From there the gradient was gradual for a while and the forest changed multiple times as we proceeded up the valley. At one point the multi-coloured Linga’s disappeared altogether, replaced by larger trees in a canopy with florescent green algae on their trunks. Eventually we had to leave the valley floor and start climbing the rocky moraine up to the base of the tours. This section was obviously much steeper but it certainly wasn’t dull. The trees at this point were now an almost exclusive fire red – the leaves seeming to move along the spectrum with their altitude. Every now and then the light would pop between the clouds every now and then the trees would flash like red flames. Unfortunately the clouds at the top of the moraine seemed the most persistent and there was no sight of the towers, which were supposedly in front of us. 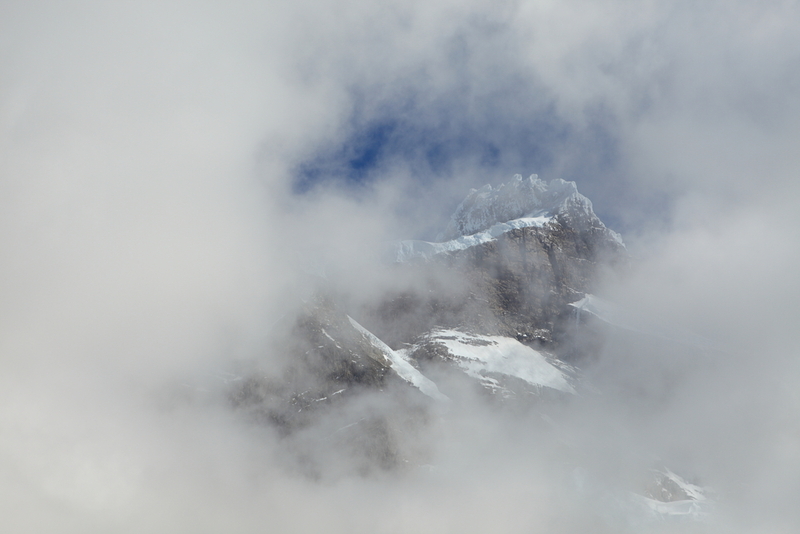 Finally we reached the top of the moraine and at that point there was an small, emerald green lake, boxed in by the moraine at our end, two walls of black granite on the sides and at the far end you could make out the base of the grey towers of Torres del Paine. The cloud was almost teasing us as we could only see about 50 metres of the towers, leaving the remaining 2000 or so meters completely obscured. We sat there and had lunch a little disheartened and then after when half an hour later the cloud hadn’t moved at all, we decided to start making our way back down. It was disappointing to leave without seeing the towers but once we started descending again the forest of red Linga helped to cheer us up. The sun had now come out completely on that side of the valley and the red trees seemed to come alive. I was taking photos of this when suddenly I turned to see the clouds behind us parting and the top of the towers appearing above us. Above was quite literally the word – I knew they were high but the high was almost inconceivable. In excitement we all ran back up to the lake and although the clouds didn’t clear completely we still got a magnificent view of the towers through the clouds. Satisfied, we started on our return trek once more. The walk back was even more spectacular than the walk up – as the sunlight was now shining on the whole valley – making the changing colours of the forest even more impressive than on our ascending journey. All in all it was one of the best day’s trekking I’ve even had – not a bad result considering how it started in the morning! From this moment I knew, this trip was definitely worth every second of travelling. 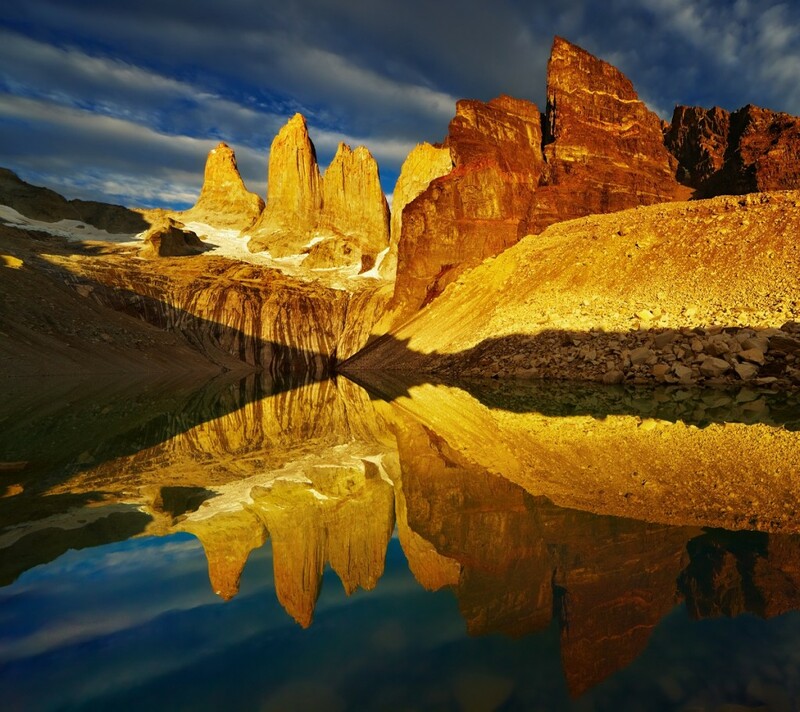 All inspired to go to Torres del Paine in Chile? Click here for more information.